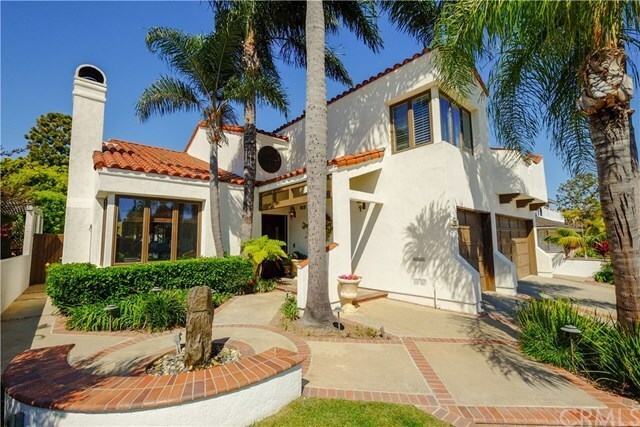 This stunning custom home designed by Brent Sears is situated on a prime hill top location in Seal Beach. This home has soaring 27 foot ceilings in the entryway leading to the dining room, updated kitchen, and spacious family room. With 3500 square feet of living space there are four bedrooms upstairs and a 5th bonus down. There are four full baths including a shower downstairs. This exquisite home has high vaulted ceilings throughout with an exceptionally dramatic master bedroom retreat. The master bedroom includes a cozy reading nook with wet bar, refrigerator, double sided fireplace, floor to ceiling built in, and two large double master closets. The expansive balcony has peek-a-boo ocean views and a custom awning. The master bathroom has double vanities with marble counter top, toilet and bidet room, private sauna, custom frameless shower and large jacuzzi tub. Many upgrades including travertine flooring, newly installed engineered oak wood floors, granite counter tops in the kitchen, new pool and spa equipment panel new and more. With a 6000 square foot lot there is a landscaped backyard with a impressive private pool w/ 3 waterfalls, jacuzzi, and space to BBQ/entertain. There is a spacious side yard that connects to the 3 car garage. With 3 fireplaces, 2 balconies, and many improvements this home has it all. Walking distance to award winning McGaugh elementary school, the many shops and restaurants on Main street, and the Seal Beach pier. Truly an exceptional home!